It was a must win game. And they delivered. The Toronto Dingos held their nerve in the dying minutes to win by two points against the Etobicoke Roos at Humber South on a sweltering Friday night. 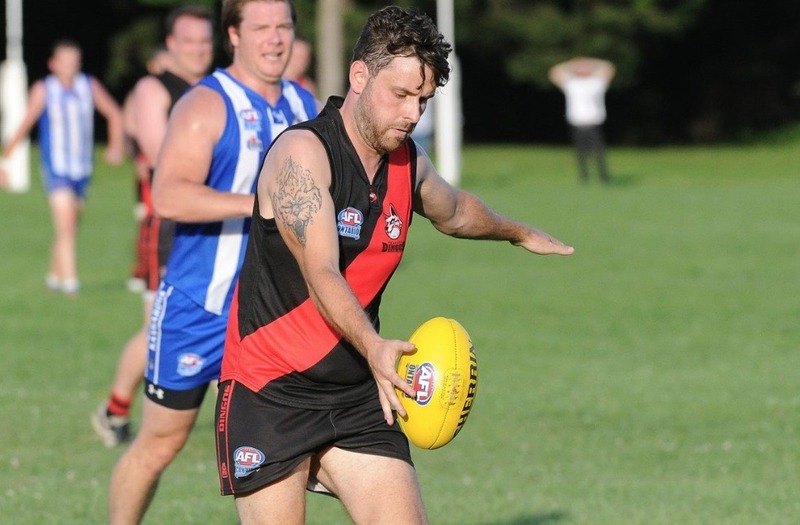 In what was supposed to be a Dingos home match, the red and black had to play another Friday night game in Etobicoke for the second time this season against the Roos, something that will be addressed with the OAFL at season’s end. The Dingos went into the match missing nine regular Div.1 players – of note Tom Humphries, Alex Aitken, Dave Wells, Spider Wells, Danny Mac - and just before the game learned two players weren’t available, leaving the team with no Canadians on the bench. Because of the summer season, numbers have been low at the selection table in recent weeks, like most teams this time of year, and the Dingos were forced to pick three injured players to make up the full 18. As expected the game began furiously, with numerous heavy hits early on. It took some time before the first goal was scored, with both sides missing set shots and shots in general play, made difficult by the heat. The Roos gained an early lead by the end of the first quarter but the Dingos hit back in the second with four goals and gaining control of the match. In the second quarter Mitch “Fridge” Stewart went off injured and didn’t play the rest of the game with a hamstring pull, leaving the Dingos with no Australians on the bench (or Canadians.) The loss of the key centre half forward who has kicked 26 goals this season, third in the OAFL, was a lucky break for the Roos as Fridgey was on fire across the wing and half forward before leaving the field. The Dingos controlled most of the third quarter and it wasn’t until the final 10 minutes where the Roos kicked a couple of quick goals that the game came alive. The Roos found some momentum, with some key centre clearances and a cracking pack mark and goal by Justin “Chippa” Harris, had turned the game on its head with a couple of minutes to go. A free kick in the centre to Roos for a centre square infringement gave them a final shot to win the match, but the backline held firm and were able to clear the ball away from the mountain of pressure.